Thomas Moss symbolized the urban entrepreneurial class of African Americans that emerged in the decades following the Civil War. Moss invested in a community-owned grocery store, the People’s Grocery, which he managed at night after spending his days working as a postman. 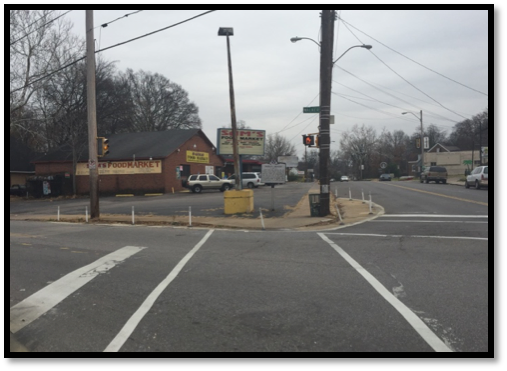 The People’s Grocery was located at the southeast corner of what is today Mississippi Blvd and Walker Ave, known then as “the Curve” for the distinctive turn that streetcars made at the corner. During an era in which African Americans were subject to racial subjugation, the People’s Grocery stood as an emblem of pride for the community. Modern day photograph of the southeast corner of “the Curve” (Mississippi Blvd and Walker Ave) where the People’s Grocery once stood. William Barrett, a white man and proprietor of a rival store in the area, felt economically threatened by the People’s Grocery. After he was injured in a scuffle that took place in the Curve on 2 March 1892, Barrett determined to use the incident to discredit Moss’s establishment. Barrett blamed his injuries on a young worker at the People’s Grocery, William Stewart. Barrett arrived at the People’s Grocery the next day with a police officer to arrest Stewart. Instead, Barrett and the officer were met by Calvin McDowell, a grocery clerk, who refused to give up his co-worker’s location. Furious, Barrett struck McDowell with a revolver, losing his grip in the process. McDowell’s athleticism got the better of Barrett. McDowell grabbed the fallen revolver and shot at Barrett, barely missing him. Barrett and the officer retreated. McDowell remarked in the Appeal-Avalanche, “Being the stronger, I got the best of the scrimmage.” This statement only fueled Barrett’s anger. Subsequently, Barrett notified the authorities of the incident. Within a few days Barrett was deputized by a Shelby County Court judge, with permission to form a group to get revenge on those who offended him at the People’s Grocery. Well aware that an attack was imminent, the patrons of the People’s Grocery asked local authorities for protection. The city of Memphis refused, as the Curve was located just outside of the city, thus outside their jurisdiction. Faced with no other option, a group of men armed themselves inside the People’s Grocery. On Saturday, March 5, Barrett and his men marched towards the Curve. 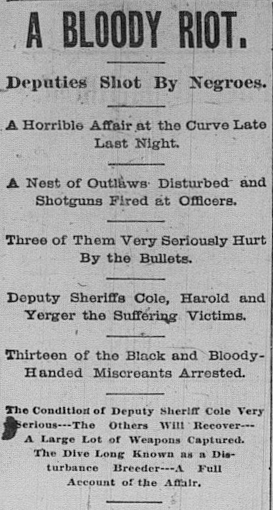 A gunfight ensued in which three of Barrett’s men were injured. The Memphis Commercial and the Appeal Avalanche inaccurately characterized the attack as evidence that the African American tenants of the People’s Grocery were planning a race war against whites, when in fact those inside the People’s Grocery were simply defending their establishment from attack. Though no evidence suggested Moss was involved in any of these events, his position at the People’s Grocery led the white owned newspapers to sensationalize his name, claiming he was the leader of a great “black conspiracy” against whites. White mobs stormed the Curve damaging property while searching for Moss, McDowell, and Stewart. The three men quickly turned themselves in to prevent any other harm to their community and were held at the Shelby County Jail as they awaited trial. After a few days, the frenzy surrounding the case died down, and security around the prison was lessened. On 9 March 1892 at around 2:30 A.M., 75 masked men stormed the Shelby County Jail and forcibly removed Moss, McDowell, and Stewart. The three men were taken a mile north of the city, where they were mutilated and murdered. 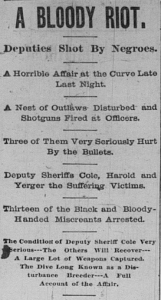 The description of the lynching in the Appeal-Avalanche and the Memphis Commercial the next morning is chillingly positive, a troubling aspect to the city’s reaction to the murders. 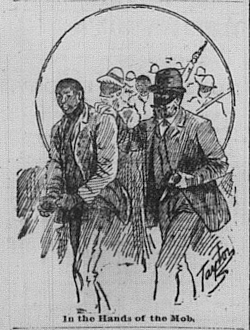 Representation of the lynching found in the Appeal-Avalanche 10 March 1892. The article gives a description of the brutal attacks conducted by the mob on the three African American men in such detail that one could identify each victim by the wounds inflicted on the bodies of Moss, McDowell, and Stewart when they were found the next morning. Even Moss’s last words were recorded, with an urgent plea to the African American community of Memphis, “Tell my people to go West, there is no justice here.” A call that many in the African American community would follow in the coming decades. The next day a mob ransacked the People’s Grocery, and the store was closed. Within a few months Barrett bought the establishment for pennies on the dollar. 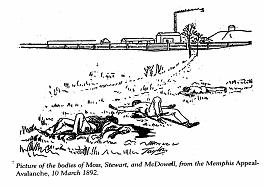 Picture of the bodies of Moss, Stewart, and McDowell, from Memphis Appeal-Avalanche, 10 March 1892. All three men are buried in Zion Cemetery. Ida B. Wells Illustration in: The Afro-American press and its editors, by I. Garland Penn., 1891. Like other lynchings in the United States at the time, the Memphis lynching stood as a warning to African Americans that pushed against the American South’s racial hierarchy. Moss was murdered for running a better business than his white competitor; McDowell, for forgetting his place in the hierarchy of the white world he lived in; and Stewart, for being in the wrong place at the wrong time. While many would back down when faced with these threats of violence, Ida B. Wells, an emerging journalist in Memphis at the time and personal friend of Thomas Moss, fearlessly attacked those who participated in, encouraged, or simply ignored the lynching. Her unrelenting attacks would eventually lead to her exile from Memphis, the place she had called home for nearly a decade. Today, the story of the People’s Grocery is marked by a single historical marker, just west of Lemoyne-Owen College, where the co-op once stood. As the Hooks Institute moves forward with our documentary film on the Memphis experience of Ida B. Wells, it is important to remember that these events happened in our backyard, to real people with their own hopes, desires, and dreams. The Hooks Institute aspires to tell these stories, and others like it, with the respect they deserve. 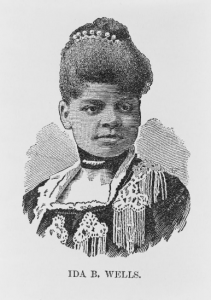 Thank you for selecting this incedent in the life and times of Ida B Wells. I know you will do her life justice and commend you as a historian and scholar. The history of race hate in America must forever remain in our collective memory, however painful, least it repeat itself in fulblown intensity if elected unchecked. I met Alfreda Duster shortly before she past, she would be proud of your courage and tenacity in completing this documentary. Thank you for your words of encouragement! Yes we must work to preserve the racial history of the United States no matter how troubling certain events may be. Thank you for this excellent account of The Lynching at the Curve. I note that March 9, 2017 will be the 125th Anniversary. Do you know of any events being planned to commemorate that day? I hope the work on the Ida B. Wells documentary is going well. We continue to appreciate the support and collaboration of the Hooks Institute. Thank you for the words of encouragement and your support. The film is moving along quite well, we are in the middle of the production phase at the moment. Unfortunately, I do not know of any events to commemorate 125 years after the lynching. Dr. Earnestine Jenkins, Art Department, UofM normally knows more about events in this city than I do, so she may know. There are activities planned March 9, 2017 to remember this tragedy in U S History. There is activity at Zion Cemetery, Second Congregational UCC (764 Walker Avenue) and at the Curve (MS BLVD & Walker Ave.). All of these activities are coordinated. 10 a.m. Vigil and Wreath Laying Ceremony in Zion Cemetery (1500 block of South Parkway East) where the victims are buried—featuring ministers from the historic black churches of the time and Dr. Earnestine Jenkins. Sorry I missed this, but it should be a special event of note in this South Memphis community. We should all be there to enhance our of awareness of our need to come back together economically, mentally and spiritually. Hopefully, we can publicize this event throughout the community to bring together the community gangs: street, church and neighbors.